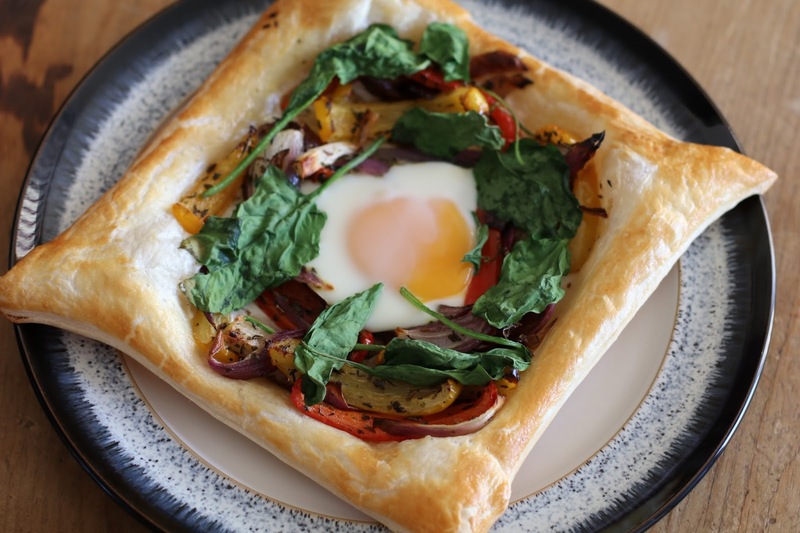 When I found this recipe I had no idea what ‘galettes’ were – a quick search of Google tells me they are “a flat round cake of pastry or bread”. Well these aren’t round, but this is what the recipe call them so lets move on. Unlike the usually brunch dishes with eggs this had no avocado or meat. 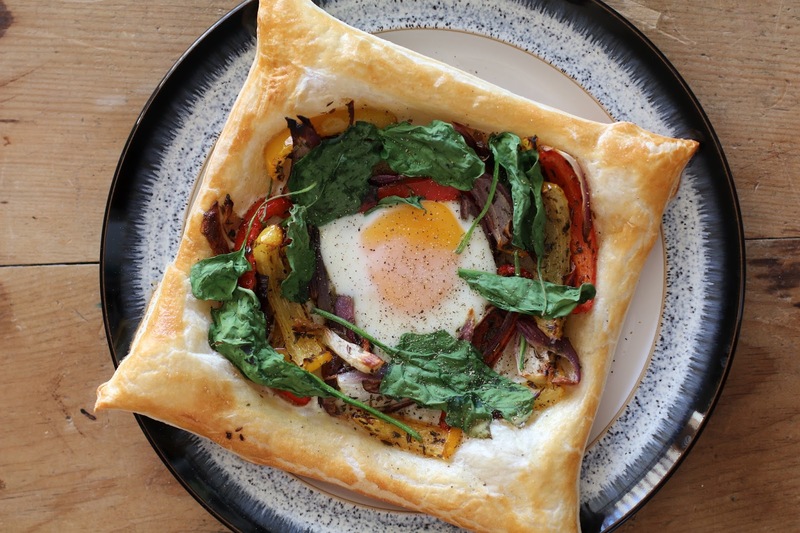 Instead it is surrounded by a good helping of vegetables and a light pastry combining all the flavours in a tasty parcel. This recipe an adaptation from a recipe out of Yotam Ottolenghi and Sami Tamim’s cookbook Jerusalem, which has been slightly altered to fit with what I eat. If your vegan you can use this vegan puff pastry or if you have a gluten free / dairy free diet then one of my favourite brands Genius have one as well. **Note: This is not the exact recipe from the book as I used alternatives such as: dried coriander instead of fresh, cumin seeds to replace ground cumin etc. I also added spinach and changed the method slightly. Additionally, this recipe is for two people, where as the books version is for four. 1. Pre heat the oven to 200º. Put the peppers, onions, thyme, cumin and coriander into a bowl and mix. Add your chosen oil and make sure everything is covered. 2. Put your vegetable mix onto a baking tray or oven dish and put in the oven for 30 minutes. Make sure you stir and flip the vegetables every five minutes so nothing burns. 3. 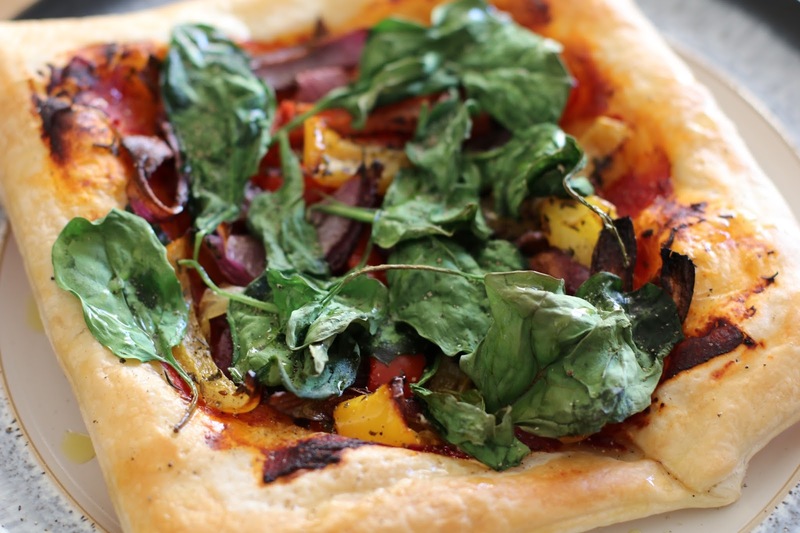 Whilst your vegetables are in the oven put your puff pastry onto a floured surface. If you need to roll it out make sure you make 2 squares. I had some pastry left over, but you can make them as big as you like. 4. Once you have your preferred shaped pastry put them onto baking parchment on a baking tray – make sure they have space between them. Prick the pastry all over but leave 1/2 inch around the edge – this is to be kept clear of food as the sides need to rise. 5. Once your vegetables are done leave them to one side to cool slightly. Do not switch off your oven. 6. Going back to your pastry: spread some sour cream or tomato puree over it, but careful to leave the 1/2inch edge clear. Now brush the edges of the pastry with either a beaten egg or milk so they will go golden when they are cooked. 7. 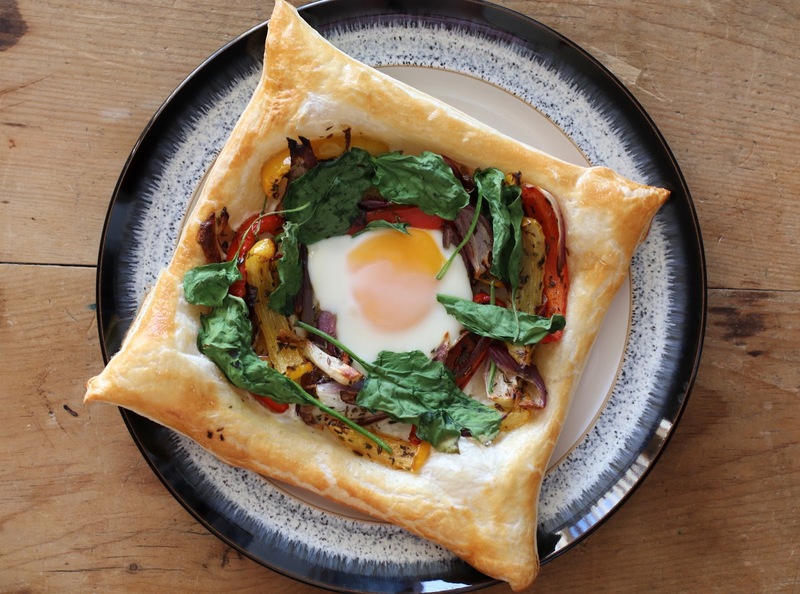 Now sprinkle the vegetables on your pastry (leaving the edges clear), you can also add the spinach. Don’t worry if the spinach overs up everything as spinach wilts when it is cooked. 8. Create a shallow dip in the centre. Crack your egg in a separate bowl (try not to break the yolk) and then pour it into the dip on your pastry. If you are not using an egg you do not need to add a dip, but I would recommend adding more spinach. 9. 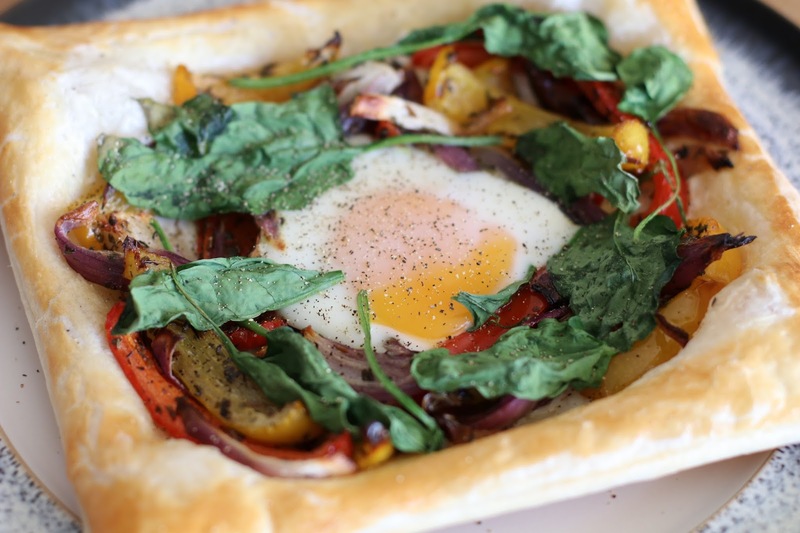 Put your pastry galettes into the oven and bake for around 10 minutes, or whenever the egg is cooked to your preference. I recommend constantly checking after 5 minutes. 10. Plate up and sprinkle a tiny pinch of salt, crack some pepper, if you chose to have some fresh herbs then add those, drizzle a little olive oil over and enjoy! If you like some heat, I recommend drizzling some hot sauce over the galette! These are great for a light summer meal, whether your cooking for yourself or a group of people. You can see my previous Brunch Edit posts here which cover a variety of brunch options that are easy to make at home. My previous brunch idea were these yummy waffles. If your going on holiday soon why not take a look at my previous post: my short haul flight essentials.